For most high schools, seven wins and a shot in the first round of the state football playoffs could be considered a successful season, but not necessarily a special one. However, the 2017 campaign was far from ordinary for Meadowcreek and its head coach Jason Carrera. The Mustangs’ 7-4 record — which tied a single-season school record for wins, its first winning season since 1990 and gave them their first postseason appearance since 1988 — was more than ordinary. You could even go so far to say that the job that Coach Carrera did last season was miraculous. 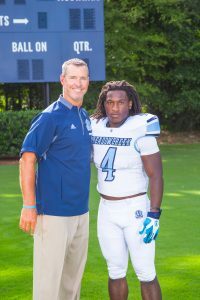 What is even more spectacular is the heart for coaching that Carrera has shared with his players at Meadowcreek and the surrounding community. CLN: What has been your biggest challenge turning a historically losing program like Meadowcreek around? Carrera: Since starting at Meadowcreek, I have been faced with many challenges. It’s big things like student athlete transiency, nutrition, transportation, culture, academics, upbringing, and little to no financial support. I have made it my task to eliminate the excuses of the players, and parents, and create a culture of success and winning. CLN: How have you approached these ongoing issues? Carrera: I have tackled them one by one. I tell the players that we take each week and each game one at a time, and I took the same approach in eliminating the excuses. Our coaching staff and support staff has provided better nutrition and more transportation to practice. We have created a family and a brotherhood that players do not want to leave. We also demand excellence in the classroom and monitor and assist our players to pass their classes in school. I reward superior classroom performance. Our coaches demand players be at workouts and attend class. As a team, we put ourselves in situations where we could be successful and learn to win. CLN: What are some things you did to change and reshape the culture at Meadowcreek? Carrera: I talk to the kids about being a “dependable.” A dependable is someone who does what they are supposed to do when they are supposed to do it, and how it is supposed to be done. That means, you are always at practice and workouts, you give great effort, you are coachable, and you are a great teammate. You can win with dependables; you will loose with a guy who cannot do these things. I have asked the players to win in the classroom, win on the practice field, and win in the weight room and Friday takes care of itself. I have tried to create a sense of family and brotherhood and a sense of self to believe they can win. I work out with them, I run with them, I talk to them about their grades weekly, and I tell them I love them. 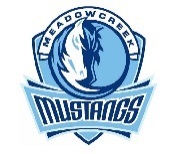 I am very hard on them and do not let up, but at the end of the day, I know it is the right thing to do for these kids to change the culture of Meadowcreek Football. CLN: How do you build upon your success in 2018? Carrera: We keep doing the things that have gotten us here, and we keep demanding perfect effort and excellence, and we teach them how to be dependables. The entire coaching staff will continue to eliminate the excuses as they arise and will continue to teach our players leadership and how to be part of a brotherhood. I continue to bring others around the program that can help our single moms and dads, and that can reach our young men to fill any gaps they may have in their life. I will continue to keep great coaches, as I have now, around our players and demand of them the same things I demand of the players. I still want to help the parents and players that struggle with housing and living conditions to keep them focused on school and football and not where their next meal or bed may be. Coach Carrera graduated from Forest Park High School in 1984, after graduation he attended the University of Tennessee at Chattanooga on a football scholarship. Coach Carrera has a degree in Marketing from Georgia State and a Masters’s in Special Education from Grand Canyon University. He and his wife are currently working on their Doctoral Degree from Walden University. Coach Carrera worked at Henry County High School for two years coaching quarterbacks and after that spent seven years at Eagle’s Landing Christian Academy coaching football, baseball, and golf. Coach then spent two years as the Head Football and Baseball coach at Flint River Academy in Woodbury, GA where he won a Region Championship and Region Coach of the Year in 2013. In 2017, Coach Carrera was named the CLN Coach of the Year and also named Gwinnett County Coach of the Year. Coach is married to his wife Michele and they have 5 children. The mission of Meadowcreek High School, in partnership with the community, is to ensure high student achievement, facilitate character development and provide opportunities for leadership development through parental involvement, effective teaching and student mastery of the AKS.